With the Tasty Tools event finished, I guess I should submit a recipe using my microplane grater too! But before I get to the recipe…. Everyday on my commute home on the days I’m in the office, I pass the popular Chinese food chain, Panda Express. One of their popular dishes is the Orange Chicken (sometimes you’re lucky if an employee waves a sample morsel for you on a toothpick as you walk past). So why is it so popular? Better yet, how can I recreate it successfully at home? The answer that I found was in the book, Cooking at Home With America’s Test Kitchen (2006). (I’ve been on a cookbook spree to revive some recipes I have stashed in my bookshelves.) Here’s what ATK has to say about the recipe: We prefer the flavor and texture of thigh meat for this recipe, though an equal amount of boneless skinless chicken breasts can be used. It is easiest to grate the orange zest and remove the strips of orange peel before juicing the oranges; use a sharp vegetable peeler to remove the strips. For extra spiciness, increase the cayenne added to the sauce to 1/2 teaspoon. The whole dried chiles are added for appearance, not for flavor, and can be omitted. To fry the chicken, use a Dutch oven or a straight sided saute pan (with at least a 3 quart capacity): do not use a 12 inch skillet with sloped sides, as it will be too small to contain the oil once the chicken is added. White rice and steamed broccoli are good accompaniments. FOR THE MARINADE & SAUCE: Place the chicken in a 1-gallon zipper-lock bag; set aside. Combine the chicken broth, orange juice, grated zest, vinegar, soy sauce, brown sugar, garlic, ginger, and cayenne in a large saucepan (with at least a 3 quart capacity); whisk until the sugar is fully dissolved. Measure out 3/4 cup of the mixture and pour into the bag with the chicken; press out as much air as possible and seal the bag, making sure that all the pieces are coated with the marinade. Refrigerate 30-60 minutes, but no longer. Bring the remaining mixture in the saucepan to a boil over high heat. In a small bowl, stir together the cornstarch and cold waterl which the cornstarch mixture into the sauce. Simjmer, stirrig occasionally, until thick and translucent, about 1 minute. Off the heat, stir in the orange peel and chiles, if using (the sauce should measure 1 1/2 cups); set the sauce aside. FOR THE COATING: Place the egg whites in a pie plate, using a fork, beat until frothy. In a second pie plate, which the cornstarch, bakig soda and cayenne until combined. Dran the chicken in a colanger or large mesh stainer; thoroughly pat the chicken dry with paper towels. Place half of the chicken pieces in the egg whites and turn to coat; transfer the pieces to the coenstarch mixture and coat thoroughly. Place the dredged chicken pieces on a wire rack set over a baking sheetl repeat with the remaining chicken. TO FRY THE CHICKEN: Heat the oil in an 11-to 12-inch ducth oven or staight sided saute pan with at least a 3 quart capacity over high heat until the oil reaches 350 degrees on an instant read or deep fry thermometer. Carefully place half of the chicken in the oil; fry to golden brown, about 5 minutes, turning each piece with tongs halfway through cooking. Transfer to a paper towel-lined plate. Return the oil to 350 degrees and repeat with the remaining chicken. TO SERVE: Reheat the sauce over medium heat until simmer, about 2 minutes. Add the chicken and gently toss until evenly coated and heated through. Serve immediately. In a medium bowl, combine all ingredients until well blended. Season your pork ribs and allow them to marinate in the BBQ sauce overnight. Grill or bake your ribs to your preference. Every first Saturday of the month, the Un-Gourmet International Cooking Club gets together to create an amazing pot luck dinner highlighting various cuisines around the world. I’ve been a part of this talented group for over a year and it’s steadily growing. We’ve even been featured in a local magazine, Time Out Chicago! Tonight we feasted on a table full of HUNGARIAN dishes. Hungarian food is known for its exotic, tasty and spicy food and delicious wine. What is different about Hungarian cooking? In general, the preference is for rich and spicy sauces, stews and sweets over rather “drier” dishes. Common ingredient staples found in the cuisine include pepper, pork, fresh green peppers & tomatoes, sour cream and sweet paprika. — Melt butter in a small saucepan over low heat with the garlic. Saute for a minute, but do not let it burn. — Add the flour to the butter/garlic mixture to make a roux. — Add salt, pepper and heat until mixture bubbles, stirring constantly. Remove from heat. — Gradually add cream or milk; return to heat and stir until mixture is smooth & thickened. — Cook potatoes in boiling water. Peel & cut in slices. Place in mixing bowl. — Dice & fry bacon until almost crisp. Add to mixing bowl. — Saute diced onion in bacon fat and add to mixing bowl. — In remaining bacon fat, add the flour and cook until smooth and bubbly. Add a touch of butter if there is not enough bacon fat. — When roux is formed, add vinegar, sugar, salt and water to make a medium sauce. Bring to a boil and cook until thickened. — Pour sauce over ingredients in mixing bowl, toss and mix to combine. — Add salt to taste if desired. 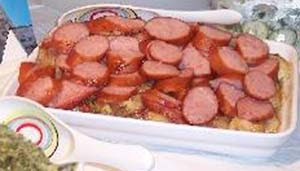 Top with sliced cooked sausage. Serves 4.